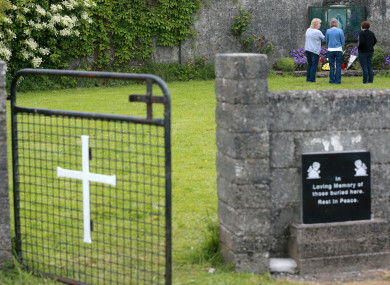 THE FIFTH INTERIM report by the Commission of Investigation into Mother and Baby Homes will focus on burial arrangements of those who died while living in them. The report, which has been submitted to Minister for Children Katherine Zappone, includes technical reports prepared as part of the commission’s investigation into the Tuam Mother and Baby Home. A decision to carry out a full forensic examination of the site was announced last October. It follows an investigation into the home by local historian Catherine Corless, who cross-referenced death certifications from the home with local burials, and found that 796 children who died at the home were not given an official burial. The Minister will consider the findings of the latest report and consult the Attorney General, before she seeks Government approval to publish the report as quickly as possible. In a statement, a spokesman said that the “dignity and memory of those who died in these institutions” would be central to the Minister’s approach, and that she was sensitive to the expectations of families for an early publication date. Email “Mother and Baby Homes commission submits report on burial of those who died in institutions”. Feedback on “Mother and Baby Homes commission submits report on burial of those who died in institutions”.